Paper writing, and the pre-writing process, is one place where the combination of being both a visual thinker and a bachelor’s-degree-in-English holder very much pays off. For visual thinkers, mind mapping can be a way to draft a well structured papers without having to do any typing! If you frequently find yourself hours into the process of writing an important paper and realizing your paper, though approaching the word limit, has no structure or well defined points, a pre-write mind map might be a paper writing technique that could shave hours off your next paper. Typically my pre-paper mindmaps are done in pencil and an absolute mess, but the mind map below is an example of how this system can work for me on a day when I need to get a paper drafted and also recognize that to care for myself well, I need some art time. I like that mind maps allow me to combine both productivity and a need to slow down and create something with care and beauty – instead of relaxing with something mind-numbing, I can sit down and let my mind wander around my topic as I color in my map. Often this space and permission to wander adds insight and depth to my final paper. mind maps allow me to combine productivity with a need to slow down and create something with care and beauty. I most often use mind-map brainstorming when I need to integrate information that doesn’t necessarily mesh well (for example, the grad paper prompt that asked me to explore how Cognitive Behavioral Therapy and Native American Sweat Lodges might intersect) or when my paper topic is a Case Study and I need to brainstorm diagnosis and treatment plans before drafting my paper. Mindmapping helps see themes and identify commonalities in a way that typical paper drafting doesn’t. As you draw connections between ideas and concepts that interact, the structure of your mind map begins to inform your main points, and how you’ll discuss themes, commonalities, and differences. Mindmapping helps locate themes and identify commonalities in a way that typical paper drafting doesn’t. Often a teacher’s prompts are so clear you can use the instructions as your paper’s outline, but sometimes a teacher’s assignments can be very vague. Mind maps help me figure out what I think about a topic- and as I begin to plot my thoughts on a page, lots of bubbles around one idea or lots of lines connecting back to one point often inform what concept I eventually turn into a thesis and main points. 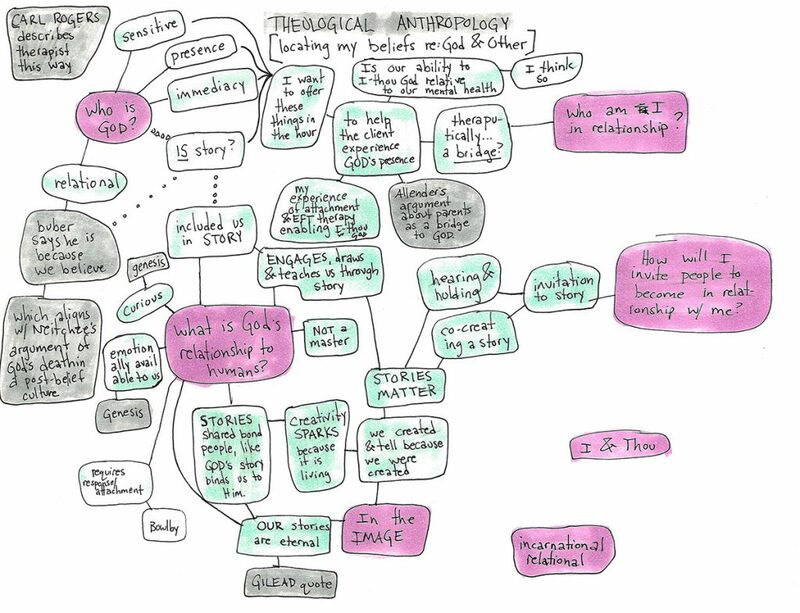 Here’s an example of a mind map for a paper I felt really at a loss on how to start: a research paper for a counseling class in seminary about “who or what God is and how he or she relates to humans”. The final paper, which I, naturally, turned in with illustrations, can be read here. Use color in mind maps to show levels of importance, such as the difference between main points and sub points.